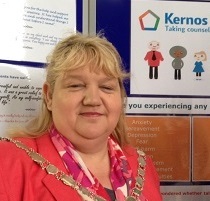 Sudbury’s new Mayor, Cllr Sarah Page, has chosen Kernos as one of the three local charities that she will be lending her support to during her term of office. There will be various fund-raising events taking place during Cllr Page’s 2017/18 mayoral year – such as a photographic competition involving local schools and a Mayor’s coffee morning – all designed to help benefit her selected charities. After her 12-month term of office comes to an end, the Kernos Centre will receive a share of the total funds that have been donated. In her inaugural speech the new Mayor announced that she had chosen her three charities – the Kernos Centre, the Richmond Fellowship and the Suffolk Befriending Scheme – because they all work within Sudbury to provide mental health care, as well as to protect people against loneliness and social isolation. She explained: “I think good mental health care provision is absolutely crucial. Getting good help is vital because it impacts people in all walks of life”.